1. Choose the right niche. To get a better idea about what niche to choose go to your AliExpress affiliate account and download ‘Bestselling Products Data Feed’. Find the products with the highest purchase volume and decide what niche to choose. AliPlugin has some filters you should play with before adding products to your site. Try to find and import products with a max. possible Purchase Volume and Feedback Score. Don’t forget to pay attention to a Product Rating as well. 3. 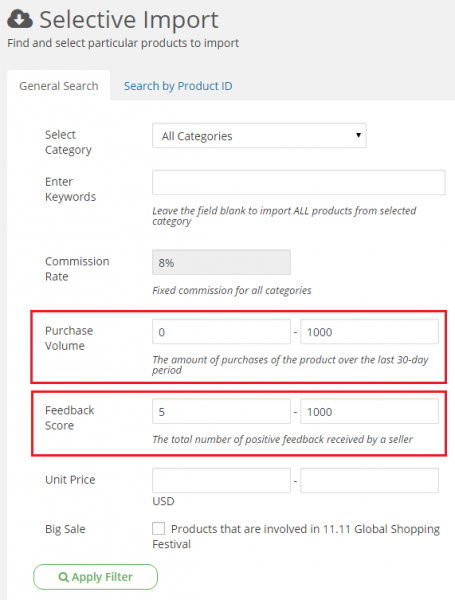 Add not more than 20,000 – 25,000 products per site. Even if you have a powerful server with a perfect hosting solution it is not recommended adding more than 25,000 items per site, because of WordPress databases that can slow down your site loading speed. 4. 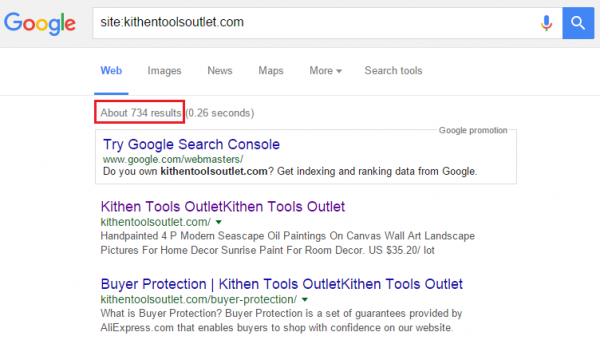 Check how many pages of your site are indexed by Google. One of the advantages of the sites built with AliPlugin is that they usually start generating organic traffic quickly, even if you don’t do any promotion work (however it is highly recommended of course). After you complete import using the plugin you get a lot of products on your store. Plenty of products on your site mean a lot of pages which Google starts indexing with the help of so called long tail keywords in product descriptions. As a result you get many pages indexed by Google = more organic traffic = more sales = more commission. That’s the reason why you should check the number of pages indexed by Google time to time. To find out how many indexed pages your site has, go to Google.com and search for SITE:YOURDOMAIN.COM. AliPlugin has an option to add reviews to the products on your site. Don’t ignore this feature, since these are real reviews taken directly from AliExpress and what is more important these reviews are located on separate AliExpress server that is hidden from Google indexation. It means that when you add these reviews to your site you get some unique content loved by Google. When a potential buyer visits a product page on your affiliate store, he sees a really great price for the item. He also sees an active timer and a strong call-to-action informing him that this is a limited time offer (“Today’s Deal”), and in an hour or two (the timer shows a countdown) the price will be higher. As a result, the visitor goes to AliExpress being highly motivated to make an urgent purchase – and his motivation is even stronger than before. Ultimately this means that you can multiply the number of purchases made within the first session – and your income grows significantly.